I was browsing through some papers my Mom gave me in 2005 when she moved from the apartment she had shared with my Dad to her retirement home and found an old notebook in which she had kept a detailed account of household expenses for a whole (presumably lean) year (only months are indicated but several clues lead me to think it was the year of my birth). Two food items appear on every single page day after day. Knowing mine was a French family, I am sure you already guessed that one of these two daily purchases was bread. The other one was milk. In my family, milk was sometimes used for soups (my mom made a wickedly delicious rice and potato milk soup) or dessert (caramelized rice pudding comes to mind), “pain perdu” (French toast) or crêpes but mostly it went into the hot Ovomaltine (Ovaltine in this country) which she had us drink every morning. We never drank cold milk and I don’t remember us having cereals in the house until much much later and then only plain corn flakes which I didn’t particularly care for as they became soggy extremely fast. I didn’t like the taste of Ovomaltine either but my mom said we had to drink it because malt was good for children. 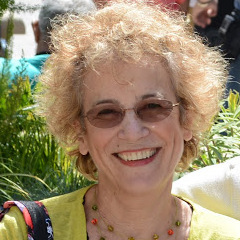 Some blessed weeks she relented and bought Banania, a hot cocoa mix based on banana flour. We loved that! My Mom never had to coax us into eating bread however. It was an essential part of every meal. 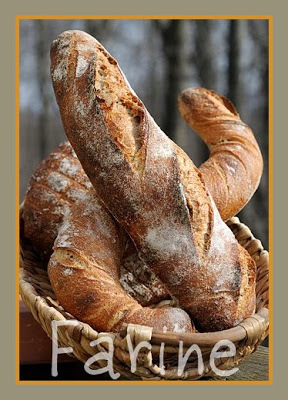 We mostly had baguettes, but also bâtards when we were in the country at my grandparents’ house. Even at age 80, my grandfather rode his Solex (motorized bike) to the next village on the itinerant baker’s day off (that baker drove slowly through the village on most days, selling bread from his store on wheels). I have no pictures of my grandfather riding his Solex with fat long loaves fastened to the rack behind the saddle but since he always wore a beret and had a big bushy mustache, I am pretty sure he must have looked like a poster Frenchman on the rides back home. Coming back from France last week, one of the first things I did was to reactivate my levain (the one I had started with Gérard) and get ready for baking again. The levain (which I had dehydrated nearly three months ago and kept in the form of dry nuggets) literally sprang back to life. I was able to use it after only two feedings. From my first batch, I made one bâtard, one funny-looking (but deliciously crunchy) S-shaped “tordu” (which I twisted but didn’t score prior to baking) and two round polka breads. Polka bread is for crust lovers. 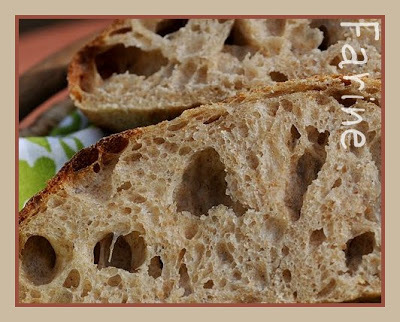 Popular throughout France, it dates back to the first years of the 20th century according to Pains d’hier et d’aujourd’hui (literally “Breads of yesteryear of and of today”), Mouette Barboff’s excellent compendium of French breads which Marc Dantan has illustrated with stunning photographs. 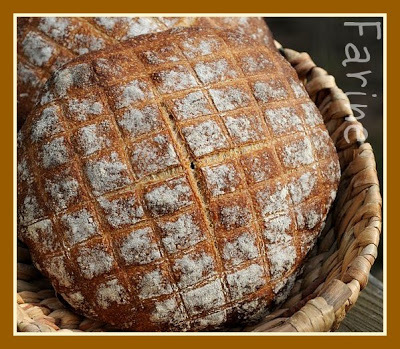 Barboff goes on to say that polka bread is a levain-fermented wheat bread, usually made from white flour. What makes it different from other breads is its tic-tac-toe scoring. 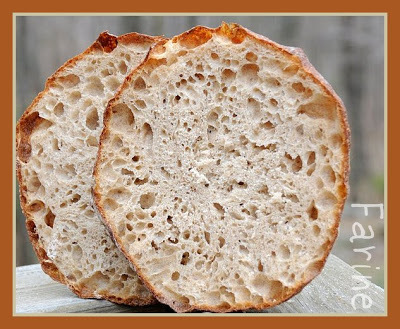 While it is often round, it can also be found in long shapes (thus offering an even higher percentage of crust). In Paris and surrounding areas, it is often sold as a 4 lb-galette shaped loaf. I hardly ever make an all-white bread, so I chose to use rustic bâtard dough for this batch but bearing in mind that polka bread is often made with overproofed dough (which would not bake into a handsome loaf if shaped and scored as usual but gives the bread an ever more complex flavor), I retarded the dough, letting it bulk-ferment at room temperature for about one hour after mixing, folding it once then sticking it in the fridge for about 14 hours. I let it come back to room temperature before shaping, proofing and baking. Remove from the oven and cool on a rack. Enjoy! The Pain polka goes to Susan, from Wild Yeast for Yeastpotting. So bread is in your blood! This story explains it all! 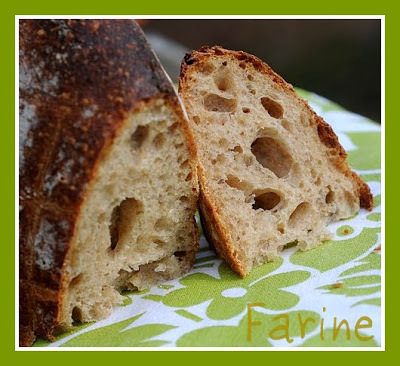 I love sourdough bread and yours look incredible! Thank you for stopping by, Mimi and doughadear!